Bourton-on-the-Water Baptist Church is a small, friendly, church situated in the centre of the village of Bourton-on-the-Water in the beautiful Cotswold hills in Gloucestershire. We are committed to serving the local community and we are actively involved with the local schools. Sunday morning worship is for all ages with a separate children's programme and crèche. Refreshments are served afterwards. Once a month there is an All Age Service which is a shorter, more relaxed service for everyone. The evening service is quieter and more reflective in style. Midweek we have regular house groups for Bible study and prayer. 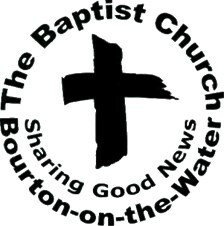 We work with the other local churches and are part of Bourton Christian Council. Our aim is to share the love of Jesus through word and deed.